Is it Mumbai or is it Goa? Peaceful palm-lined streets, unspoiled beach, and pervasive Portuguese heritage make the town of Vasai, on the northern outskirts of Mumbai, surprisingly reminiscent of Goa. You'd never guess it but Vasai was once of more importance than Mumbai. In the 16th and 17th centuries, it was a headquarters of Portuguese rule with a thriving fort city. Nowadays, it's a cool oasis that feels blissfully stuck in a time warp. 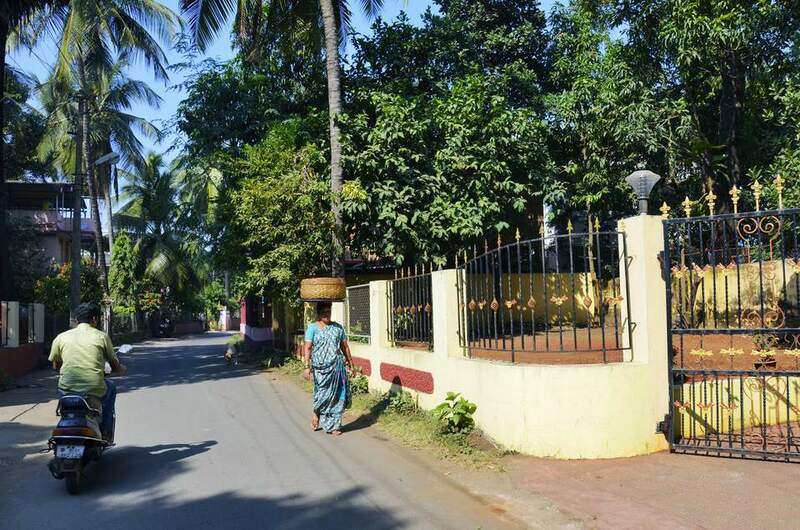 Unlike surrounding areas, much of Vasai has been spared from development, as it remains delightfully cutoff from the city's encroaching urban sprawl. Currently, the only bridge over Vasai Creek, which separates Vasai from the rest of Mumbai, is a rail bridge. Vasai's distinguishing history and tranquil environment (with fresh air!) mean it has much to offer travelers who want to get off-the-beaten-track. Two centuries of Portuguese rule still reflect on the religion and lifestyles of Vasai's inhabitants, who are predominantly Catholic. Their culture eclectically blends Konkani, Portuguese, Marathi and British influences. I visited Vasai on this unique full-day Cultural and Heritage Tour of Vasai conducted by local guide Leroy D'Mello, who owns Amaze Tours. After working in hospitality and hotel management, including stints as a chef in luxury hotels and on international cruise ships, Leroy realized that he wanted to start a tour business promoting Indian culture and traditions. He knows Vasai intimately as his family have lived and owned land there for many generations, and this makes for a really insightful and personal tour. You can visit ornate churches, see artisans at work, sample homemade regional cuisine, and participate in the cooking process. Read on to learn about the attractions covered on the tour. The ruins of Vasai's sprawling fort are undoubtedly the town's dominant attraction. Exploring it will take you back time to a defining period in history when the fort was a prosperous living city during Portuguese rule. Its sturdy walls protected the opulent mansion of Portuguese noblemen, as well as churches, convents, temples, hospitals, colleges, and administrative centers. The fort also speaks of the lengthy Battle of Vasai, between the Portuguese and Marathas, which finally ended with the Marathas capturing the fort in 1739 after much bloodshed. There are about 40 churches in the Vasai area. Some are hundreds of years old. They have remarkable historical significance and are still used for worship today. Saint Thomas Church, Vasai's most important church, was built in 1566 and was the first church to be founded outside Vasai fort. It was apparently so rich that Muslim Arab invaders from Gujarat looted and set fire to it, in 1571. It was rebuilt in 1573. It's unknown when the second most important church, Our Lady of Grace Cathedral, was constructed. However, it's believed to be in the 1570s. 135 year old Rautwada is one of the few heritage homes remaining in Vasai, and even in Mumbai. These days, most have been replaced by modern apartment buildings. The house is made of teak wood and the tiles on its exterior are the same type that was used on Chhatrapati Shivaj Terminus (Victoria Terminus) railway station, built by the British in Mumbai in 1887. Inside, there are old implements and antique furniture. Surrounded by lumps of wood of all shapes and sizes, statues of Jesus and the Virgin Mary are industriously carved at the workshop of Roque and Renold Sequeira Brothers in Vasai. This fascinating business was founded in 1920 and has been operating for three generations. From humble carpentry beginnings, the statue makers have so far collected five UNESCO awards for heritage conservation. Their first award was earned in 2005, from the painstaking restoration of the 140 year old Dr Bhau Daji Lad Mumbai City Museum. When I visited the workshop, a statue from Daman, dating back to the 16th or 17th century, was there to be restored. The Sequerias also receive customs orders from all over the world, including orders for gold plated statues. It takes about a month and a half to complete a statue. The process begins with clay modelling of the image that's been provided. The model is then recreated in wood, which is usually sourced from Goa and the Konkan region. Its head must be sawed off to insert the lifelike eyes but the join is hardly noticeable afterwards. A man of many talents, Renold Sequeira is also a keen amateur astronomer. Two of his models are displayed in the Sydney Observatory and Powerhouse Museum in Australia. For inexpensive, hygienically prepared food that's just like what you'd get at home, head straight to Mahila Mandal near the New English School on Mahatma Gandhi Road in Vasai. It looks nondescript. However, the food is scrumptious and there is a special story behind it. The restaurant is part of a super inspiring NGO that was set up 25 years ago by local teacher Mrs Indumathy Vishnu Barve to employ women in need. (Unfortunately, many families lost income after the mills in Mumbai closed down). Now, it has seven centers in and around Vasai, with more than 250 women involved! And, Mrs Barve is more than 90 years old and still active! Not surprisingly, the food is very popular. I had a plate of batata bhaji (dry Maharashtrian style potato dish) and chapatti for about 30 rupees. There was no time to take a picture as it was so good, I greedily devoured it in 2 minutes flat! Instead, this is a picture of the ladies who made it. Read more about Mahila Mandal and its founder in this article. The Catholic community in India is known for its distinctive cuisine that's a fusion of cooking styles. Of course, a cultural and heritage tour of Vasai wouldn't be complete without experiencing the food! Visiting the home of a lovely lady with a passion for cooking, I got to participate in making sandni. This local type of flatbread is prepared from a batter of split black bengal gram and rice flour, which is steamed. The bread complemented the delicious lunch that was cooked by Leroy's mother. The predominantly meat-based dishes in Catholic cuisine are a non-vegetarian's delight. Prior to lunch, we made popular delicacy foogyas (also known as gulgule). These fried balls of flour, coconut milk, cumin, sugar, salt and yeast are crispy on the outside and fluffy on the inside. It's impossible to eat only one! Vasai is a recommended side trip from Mumbai, not only to escape the city's crowds and chaos but to learn about India's minority Catholic community and the town's historical importance. The town has a surprisingly large number of attractions. Unfortunately I didn't have time to see all of them. In addition to what I covered on the action-packed full-day Cultural and Heritage Tour of Vasai, it's possible to go on boat ride and visit Vasai beach, local fishermen's colony, and local farmer's residence. In reality, to get the most out of a trip to Vasai, you should stay overnight. There's so much to pack into one day, it gets exhausting. Leroy aims to add a homestay for visitors soon, which will really enhance the experience. Vasai is located about an hour north of Mumbai. The Mumbai local train is the most convenient way to reach Vasai, as the only bridge across Vasai Creek (which separates Vasai from the rest of Mumbai) is a rail bridge. Take a Virar-bound train, originating from Churchgate on the Western line, to Vasai Road railway station. (Avoid peak times, as this is a notoriously crowded train!). From the station, take a bus or auto rickshaw. Vasai Fort is around 20 minutes away. If you go on a tour with Leroy, he will pick you up from your hotel and travel with you by train to Vasai. Otherwise, if driving from Mumbai, the only option is the Western Express Highway (National Highway 8), which is a much longer route.